Sony didn’t just gush about its recently released smartphones and speakers during this year’s IFA, currently taking place in Berlin, Germany, the company also presented some Google Assistant-integrated speakers that Sony hope you’ll include in your humble abode. But is this really an home addition worth having? It’s called the LF-S50G (yes, the name could use some work), and are Sony’s new Smart Speakers, which are ready to serve you with the functions of Google Assistant. The integrated artificial intelligence assistant integrated into the wireless speaker can be activated by the usual OK Google and can be used to do such things as adjust the lighting of your smart bulbs, the temperature of your smart thermostat, play your favorite playlists, turn on the TV to play YouTube while you cool in the kitchen, turn up the volume of your TV etc. The AI smart speaker LF-S50G is also integrated with gesture control to adjust the volume, play a song or skip to the next one. It’s water-resistant, meaning you can place it in your kitchen without fear of water damage. The speaker has a small built-in screen, which is hidden under the cloth covering, which displays the time. 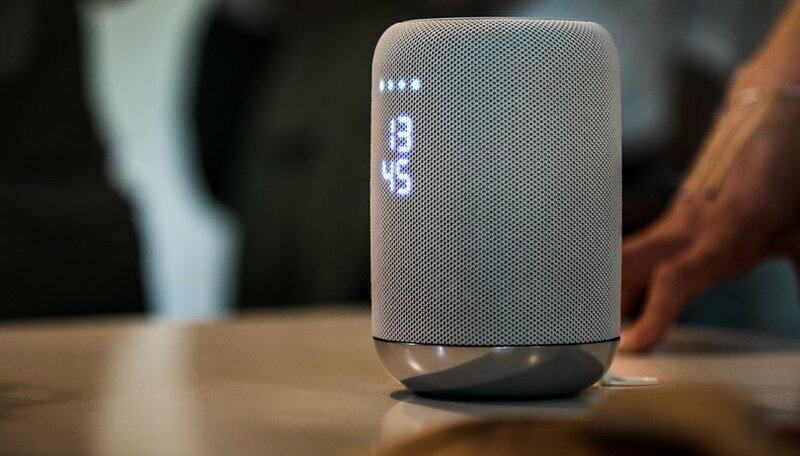 The speaker can be connected via NFC or Bluetooth, has a very minimalistic design and really reminds me of Apple’s own HomePod, just without Siri for course. Google Assistant is the star of this show. The number of speakers that are integrating Google and its assistant is seeing a steady increase, and as a consequence, the end user will soon see a plethora of speakers that offer will offer the AI assistant on board. Soon, these manufacturers will have to think outside the box to provide something that is unique from the rest. In Sony’s case, the LF-S50G seems to be different in that it really concentrated on providing a great audio experience. The LF-S50G offers full-range sound thanks to two omnidirectional speakers. Sony’s smart speaker will arrive on the market in October, coming in black and white, and be sold for 199.00 USD. What do you think of Sony’s speaker? If you could choose between Google Home and LF-S50G, which would you choose?